This Psalm is a desperate, impassioned plea for God's assistance during a time of war. Assaf, the author of this prayer, describes a multinational alliance that was formed against the Jewish kingdom with the explicit goal of obliterating it. 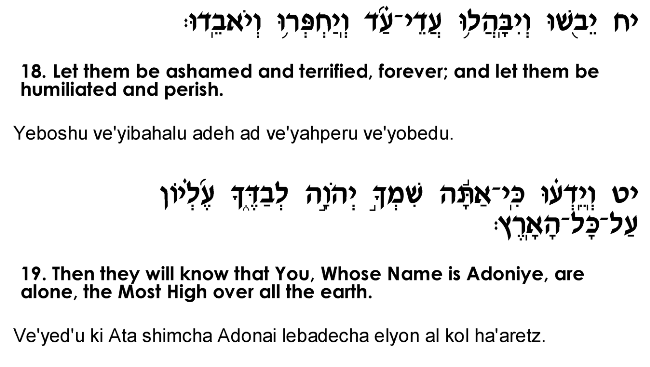 The tone of this prayer very clearly reflects the tension and anxiety of a real, immediate danger to the nation's existence, and the realization that God's overt intervention holds the only hope for Am Yisrael's survival. In verses 10-12, Assaf makes reference to some of Am Yisrael's storied victories from the past, and asks God to repeat those miracles in the nation's current crisis. In particular, he speaks of the triumph over the Caananites during the time of Devora (Shofetim, chapter 4) and the victory over the Midyanites under the leadership of Gidon (Shofetim, chapters 7-8). Assaf concludes this prayer by asking that "they shall know that only Your Name is God – supreme over the entire earth" (verse 19). A victory over the enemy nations will prove to them the truth about God's existence and His unlimited power over the world. The Radak (verse 1) claims that Assaf refers here to the battle waged against the Jewish kingdom during the time of the righteous king Yehoshafat. We read in the Book of Divre Hayamim II (chapter 20) of an alliance of hostile powers that encamped in En Gedi, east of Jerusalem (near Jericho), and sought to destroy the kingdom. 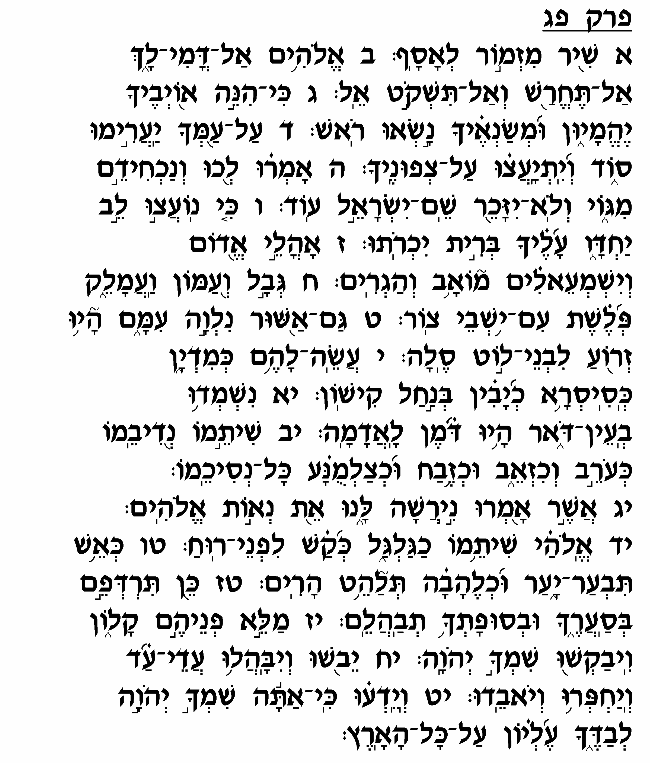 Yehoshafat offered a beautiful prayer to God in the Bet Ha'mikdash before leading the army to battle, in which he expressed the same feeling of desperation reflected in this Psalm. He exclaims, "for we have no strength before this huge multitude that is coming upon us; we know not what to do – but our eyes look to You!" (Divrei Hayamim II 20:12). God indeed intervened to rescue the kingdom, and ambushers secretly attacked the allied nations' forces even before Yehoshafat's army arrived there. The allied nations suspected each other of setting the ambush, triggering a bloody conflict among the forces which left the entire army dead. Assaf's prayer here in Tehillim that God should bring shame and humiliation upon the enemy nations (verses 17-18) was indeed answered, as these nations suffered defeat without ever even confronting the Jewish army in battle. This story, like many others in Tanach, teaches of God's ability to deliver and rescue even in the most difficult situations, and in ways that people could never have imagined. Even when "we have no strength," when we feel entirely incapable of surmounting the obstacles before us, we can turn to God for assistance and place our trust in His unlimited ability to help.